When Lang invited me to be a guest blogger at Miracle of Nature, I gave a lot of thought to what I might be able to offer that’s a little different from the local observations and explorations I write about in NE Ohio, (the location of my blog, “Listening in Nature”). What I decided to do is write a series of stories about listening in a very specific location. 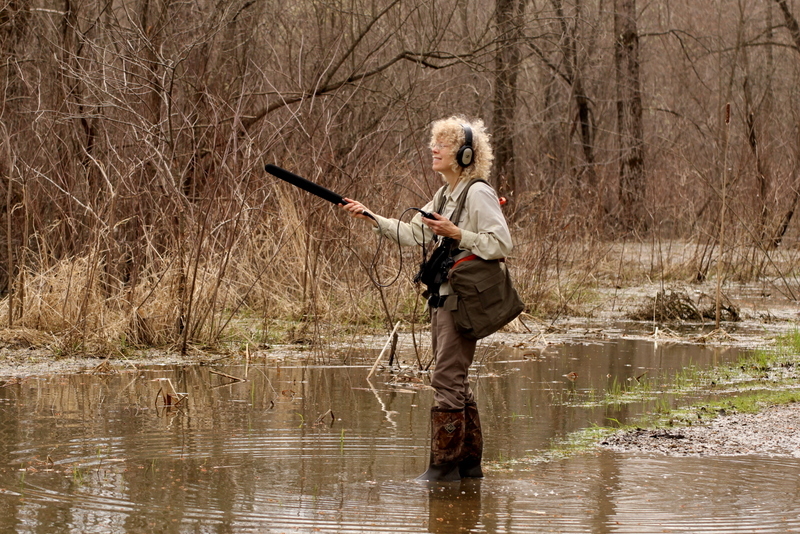 I’ll be observing the birds, amphibians, and insects I see – but especially hear – in that location and share my field recordings of those individuals so you can hear them along with me. I find it endlessly fascinating to learn one spot well enough to really understand what I’m hearing there, which then leads to an ongoing relationship with that place in nature. You may have found that sorting out bird songs from the overall sound texture can be pretty challenging sometimes. This is especially true in May, when everyone seems to be singing at once! So we’re going to limit this exploration to a relatively small area, and we’re going to learn what we hear a little at a time. I can break this down in a way that I think will be intriguing and encouraging. Do you have a special place? A favorite park? A quiet trail? A pond? Your back yard? I’ve chosen a pond on the Case Western Reserve University farm outside of Cleveland. I’ve studied the birds there in the past, and I’m inviting you to join me as I revisit this pond in 2014 to see who’s singing and nesting there, who’s new this year, who isn’t there now, and how everyone is interacting. Come walk and sit with me, then go back to your old favorite spot or a new spot you’d like to get to know. Do the same thing and see what you can learn – it will be engaging! I would like to invite you to notice the birds and other wildlife you see – but especially hear – in your special place, including your back yard. You’re welcome to tell me what you hear in your special place, too – you can comment after any of my blog posts. It sounds like so many birds are singing at the same time! How are we ever going to sort out who all is singing, let alone what they’re saying and what they’re doing? We’ll do this one step at a time. First, who are the birds that are most likely to be singing around a pond? Red-winged Blackbirds.Song Sparrows.Yellow Warblers. We can usually count on a Robin nest and a Cardinal nest somewhere in the vicinity. Let’s see if we can find them, and then try to notice if there are other species that are singing consistently enough that we can find and identify them as well. Yellow Warbler: yes, there are two males singing in exactly the same locations that I hear them year after year. I almost never see them, though, as they are so well hidden in the shrubs around the pond. This is when bird song is especially helpful – birds you can hear but can’t seem to spot. But wait, aren’t there two different songs here? Are both of them Yellow Warblers? Yes and yes. We’ve only just started our walk, and we’re already coming to one of my favorite teaching concepts: Theme and Variations. So we know that both songs are Yellow Warblers, and we also know that the one by the gravel driveway sings the less common song. 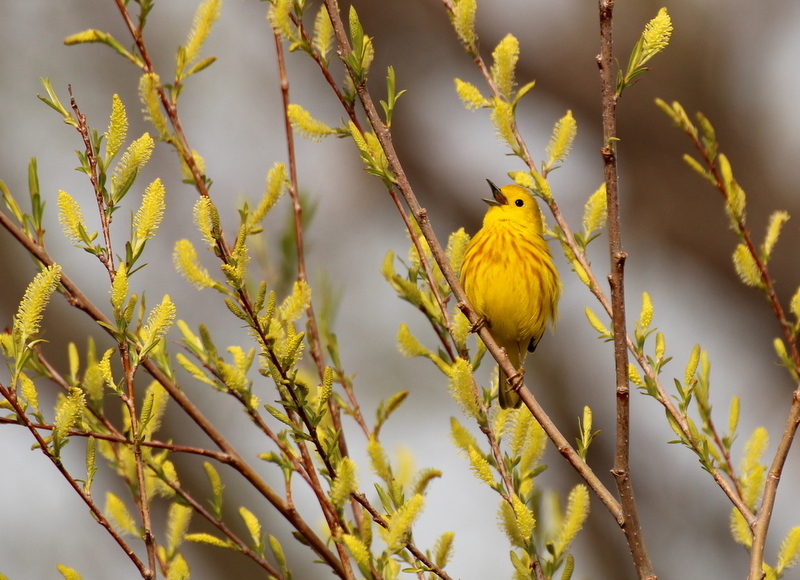 I’ve also heard him sing the more common song, and maybe we’ll find that the other Yellow Warbler sings additional songs. But there are some additional loud, insistent birds that have been singing in some of these recordings. Do you know who they are? That’s where I’ll continue next time – see you then! Thanks for this Lisa. I look forward to your next entry! I must say that I like your name. How appropriate for someone that is involved in studyinng the natural world. I have enjoyed the very nice bird pictures and associated calls. I have observed a small bird on the size of a chicadee that I think might be a type of wren. I only had a short time view of it and it appeared to be redish brown and it’s tail was angled up and not in line with it’s spine like a robin. I have heard a pretty song but have not been able to see the bird responsable. I have wondered if the song was produced by the bird I briefly saw. Will you be covering the wrens in the future? Hi, Tom. House Wrens are coming up shortly in my next entry about the pond. Their songs sound like a loud, emphatic, rapid jumble of notes. You might also want to listen to the Carolina Wren. House Wren songs seem quite consistent to me, but Carolina Wrens have song variations. Some of their songs sound considerably more melodic than those of House Wrens. Thank you for this wonderful group of pond singers 😉 and the beautiful photos too! I have a wild, organic 1/3 acre suburban yard, well-treed (maple, oak, evergreens), with nurse logs and brush piles, flowering bushes, ground covers, and birds (and skunks… There have been robins nesting here for all the 22+ years I’ve lived here. And cardinals, and song sparrows, and bluejays, chickadees, white-breasted nuthatches, downy and hairy woodpecker pairs, mourning doves, a Carolina wren pair, a Northern flicker pair, and lots and lots of house sparrows and about 4-5 resident squirrels. I try hard to keep the birdbath filled in winter and summer, the suet feeder filled in winter, and bread crumbs, food scraps, and a squirrel-proof seed feeder for everyone. 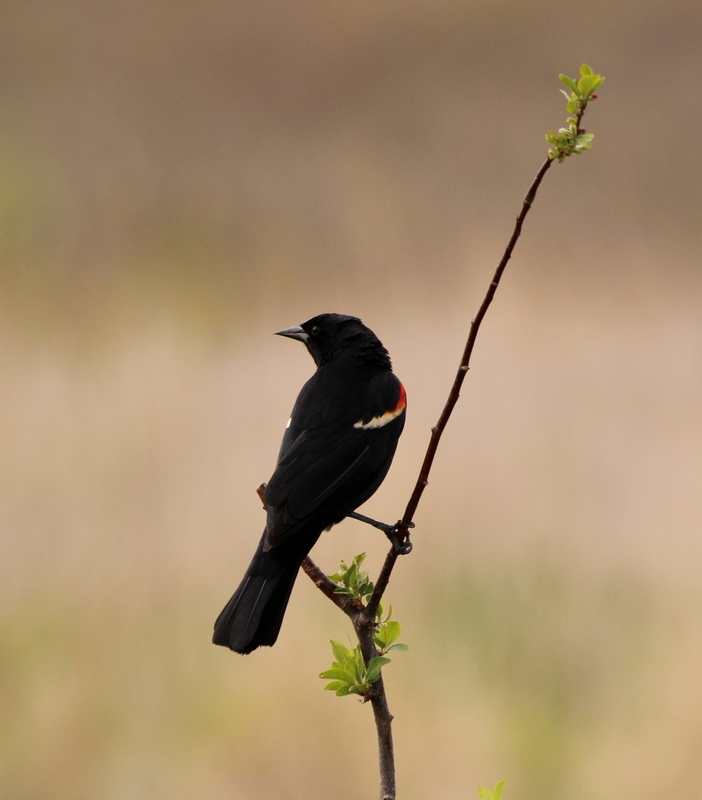 When I used to go to Broadmoor sanctuary where there are beautiful ponds, the male red-winged blackbirds perched on the cattails and dueled in song for mates… This song selection is deeply appreciated–and your blog post. And so many fine comments too! I too would love to hear the entire cacophony or melodies together and see if I could recognize the singers. But maybe it doesn’t matter–what a symphony it would be–like the music in my back yard when many of them sing simultaneously…. Your yard sounds wonderful, Carol! Mine is in an old, inner-ring suburbs and is a little smaller than yours, but it’s also a rich wildlife habitat that’s filled with song – even though the singers have to compete with human noise. When we can create a concert hall, the musicians will come. Awesomely beautiful! No much can beat bird songs…and with what you’ve arranged…all I have to do is go down the list to find a song from an unknown bird ! Thanks, Steve! More choristers from the pond will be revealed soon, too! Thank you so much! What beautiful sounds! I really enjoyed your concert and will be looking forward to hearing more in the future. Thank you very much. What a treat. Thank you for your fine recordings and the breakdown of each bird. I’d love to hear the whole chorus as well to see if I can pick out the individual songs, as that would be how I would hear it initially. I love this concept of picking out all the creatures in one specific location. Very nice idea! Looking forward to your next pond visit! I have a little pond in my back yard. Your wonderful invitation to listen to the pond is intriguing. Pictures are just great..Thanks for making my summer lots of fun and a challenging learning experience.. Thanks, for writing, Lois! The more we listen, the more we learn and it really is quite fascinating.